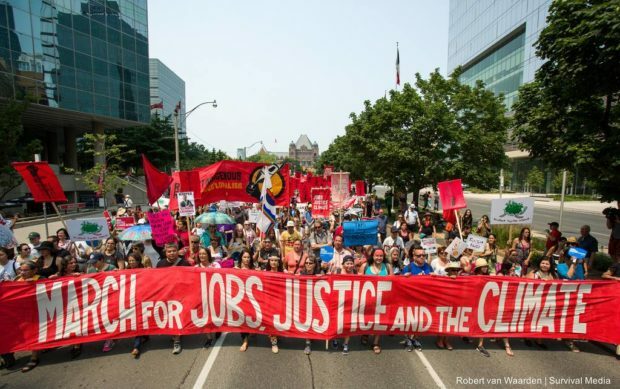 Workers rally for a $15 minimum wage at the March for Jobs, Justice & the Climate on July 5. There is a growing consensus across Canada – and indeed across North America – that all workers deserve at least $15 an hour. So popular is the notion of a $15 minimum wage that the matter is now a key issue in the federal election. Tellingly, opponents of a federal $15 minimum wage are not discussing whether low-income workers deserve a raise. Nor are they debating the merits of $15 an hour. Instead, they are trying to focus the debate on who’s going to get it. For proponents of a $15 minimum wage, this in itself is a victory. It shows that a $15 minimum wage has become such a common-sense notion that not many politicians are confident to tell voters that low-income workers don’t deserve to earn wages that bring them above the poverty line. Of course, it is true the federal government can only make laws that apply to federally regulated workers. This isn’t the choice of any political party. This is the reality of Canada’s legal system. And it’s a reality that may be disappointing for the millions of us across Canada who earn less than $15 an hour and whose hourly income falls well below the poverty line, even when we work full-time. But if a political party genuinely cares about raising the wages of low-income workers then it is their responsibility to use every available policy lever at their disposal from establishing a decent federal minimum wage to restoring the Fair Wages and Hours of Labour Act. This is precisely why a $15 federal minimum wage is not insignificant, as some have claimed. In fact, achieving such a standard would be a crucial step toward winning a $15 minimum wage for every worker, in every province in Canada. First, a $15 federal minimum wage would directly improve the wages of over 135,000 federally regulated workers who earn less than $15 an hour. Such workers include bank tellers who earn poverty-level wages (the average wage of bank tellers is about $13.80), while banks make billions in profit year after year. Such workers would also include airline workers, transportation workers, railway workers and many other trans-Canada employees where workers are responsible for the health and safety of passengers and communities and for the wellbeing of the environment and natural resources. Such workers will have more disposable income and, as customers, will help stimulate economic activity that will in turn create more jobs. Second, raising wages for low-income workers in one sector of the economy helps raise wages in other sectors. When low-income workers have better employment opportunities, they may leave one low-wage job for another that pays higher wages. Employers may then choose to pay higher wages in order to keep their employees. In this way, a $15 federal minimum wage will indirectly help thousands of other workers including those already earning $15 hourly. Third, federally regulated workers comprise a greater proportion of the population in some provinces than in others, which means the effects elaborated above will have an even greater, positive impact on the provincial economy. Perhaps most importantly, a government elected on a platform of enacting a $15 minimum wage federally will reflect a consensus among voters across Canada and Quebec that workers deserve at least $15 an hour. Such a consensus will make it easier for voters to persuade provincial governments to implement a $15 minimum wage in their respective province. The minimum wage debate is a litmus test for a political party’s commitment to decent work, whether we are talking about banks, pipeline companies, or telecommunications firms. In this context, the attempt to discredit the $15 federal minimum wage proposal by railing against the constitutional arrangements of Canada (over which no political party has control) is clearly a red herring. Voters already know that the minimum wage is a federal election issue. It’s time to let the candidates know this, too.